Caterham's 2013 car broke cover today, emerging from the garage into the Jerez pit lane as the sun rose on the first day of testing in Spain. The CT03 has a similar colour-scheme to last year's car, but there is more green and less yellow, with the brighter colour limited to a stripe on the sidepod, and a patch at the back for Renault. 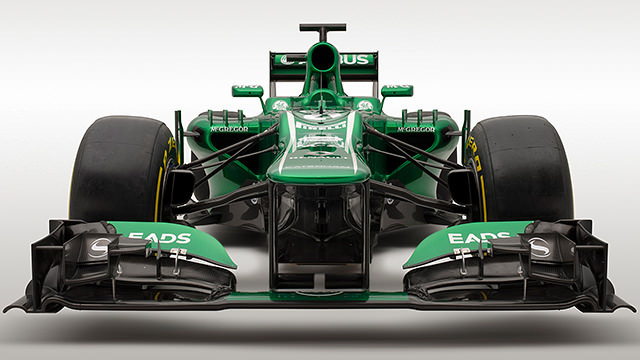 As with most of the other teams, Caterham openly admit this year's challenger is an evolution of the 2012 machinery, but they are proud of the fact it is the first to be produced in their new Leafield Technical Centre. Team Principal at Caterham, Cyril Abiteboul, is also happy with the car for a different reason. This is the first car we have produced since I joined the team so this is a proud day for me. I am very pleased that we have been able to allocate our resources and budgets as efficiently as possible to produce a car that will allow us to consolidate our position in Formula One whilst also starting work on the 2014 car as early as possible. Changes to the design include areas around the sidepods which have been "significantly undercut to improve airflow" and to the diffuser and engine cover. Cooling the car seems to be a high priority for the team, and Technical Director Mark Smith admits they will be bringing the bigger upgrades (front and rear wings) as the season gets underway. Along with a brand new car, the team are fielding an all-new driver line-up as well, with Charles Pic moving over from Marussia and Giedo van der Garde making his F1 debut. Abiteboul was full of praise and hope for the debut of this pairing. Driving the cars this year are Charles Pic and Giedo van der Garde, two drivers who give us a good mix of youth and experience inside and outside Formula One. Charles and Giedo are both young and dynamic and we expect that their enthusiasm for the sport and the team will be fuelling our growth. 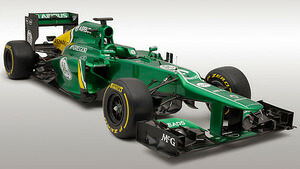 The Caterham team are feeling confident about the coming season, but they'll need to watch their wing mirrors closely. Marussia weren't far behind (sometimes in front!) in 2012, and it will likely be a similar battle this year as well.